The Unemployed Life Goes On… but may end soon!… and Do you know YOUR job description? It’s been a while since I posted anything; primarily because I just don’t have that much to post right now. The tentative offer remains but I haven’t actually been hired yet. I wonder if I can add professional job seeker to my resume now ; ) let’s see, that makes for increased tenacity, expert form-filling skills, and willingness to ‘adapt to current trends’ – read will take anything that has benefits. Had a wonderful, initial phone interview and in the process of scheduling a face-to-face with the company that I really want to work for/with. Thank you for your follow through, Keri! and…. This video really stopped me short. It’s a must see for all United States Citizens. Do YOU know YOUR job description? The legislatures generally don’t seem to. I’ve been surprised at some of the friends and acquaintances which have been laid off in recent weeks. People with solid skills, leadership positions, even upper management are now unemployed after decades of working with the same employers. Although we keep hearing that the trend is toward increased employment we really aren’t hearing much about the under-employment going on, the loss of any upward pay trending, etc. Utah’s unemployment rose to over 7% which is a bit below the national average yet still has a significant impact. Friends who have good jobs are worried. They aren’t purchasing things they would typically be replacing; everyone seems to have gone into survival mode. Those of us who are unemployed are getting a bit frantic. We’re all waiting to see what happens with unemployment extensions when Congress is back in session. I get a bit annoyed at the little comments about being a freeloader when I have to pull out my Eppi Card (unemployment benefit form of payment) at the gas station or grocery store. The vast majority of people living on unemployment are searching for jobs, applying for any and everything possible. There are hundreds of people for every opening with the exception of highly specialized fields and now there are even dozens for those positions. I don’t think that I have seen a position listed lately with the type of pay rate it would have demanded two years ago just to get applications. For the last three years before becoming unemployed I earned less than the previous year. I’m not hurting nearly so much as many are though. I’m both grateful and angry when reviewing my own situation. I’m blessed to have a place to live, to have my children with me, to have food in the cupboards and gas in my car. There are thousands that don’t. It bothers me that they don’t. According to recent news reports, Utah’s homeless rate is up 30%, and at least half of the homeless are families. The homeless rate in minors is up over 100% from two years ago. Many people – myself included – are no longer financially capable have their own housing and have been forced to move in with friends or family to have a roof over their heads. Utah is an unusually family oriented area so when people aren’t able to have relatives, friends, fellow church goers or find other means of shelter it means that the real homeless rate is far higher than indicated. Ok… climbing off the soap box now. wheww… bet you’re so done reading all that! Will things get better? Yep. 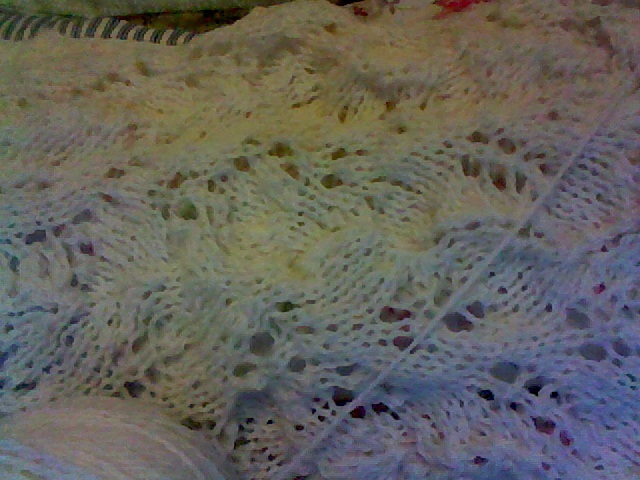 The Beverly Cardigan is going rather slowly as I’m trying to get Mom’s stole finished. It’s roughly 3′ long now unblocked. Quite frankly, I’m only knitting three days a week right now. It should be more but since I’m out of meds the old arms don’t want to cooperate. Silly arms. It’s okay though, I’ve found that ibuprofen helps enough to move them even if it’s a bit tricky at times. I had to laugh at myself this morning as it seems a very old woman has moved into my body. As I was getting out of bed, I stepped down on the left foot which means I had no balance at all then caught myself with my left arm which well… was less than graceful. How does someone bruise their arm on a mattress? I mean really! I was laughing at myself as it happened it was so silly. I should make up some sort of good story – something involving fun and adventure. Saying ‘I fell out of bed’ makes it sound a bit more dramatic than it was and ‘I have no balance’ is just stupid! This entry was posted in job search, knit, US Constitution. Bookmark the permalink.